Welcome to WalkingRobots.com, I hope you find this page interesting and informative. 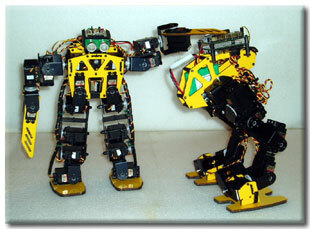 So read on and see some of the interesting things I have been doing with walking robots over the last 10 years. Ever since the very creation of the word Robot, people think that robots should look and act like humans. But until recently, this has only been a fantasy. Making a true robot that can actually walk like a human, or remotely look like a human, has been trapped in the realm of science fiction movies and books. Though the recent amazing humanoid robotic development efforts have been conducted by large corporations and research universities with multi-million dollar budgets, humanoid robots can actually be built at home by the average person. I am hoping that the information that is presented here will help to inspire, and will help you to learn how to begin "walking" in your robotics development efforts.